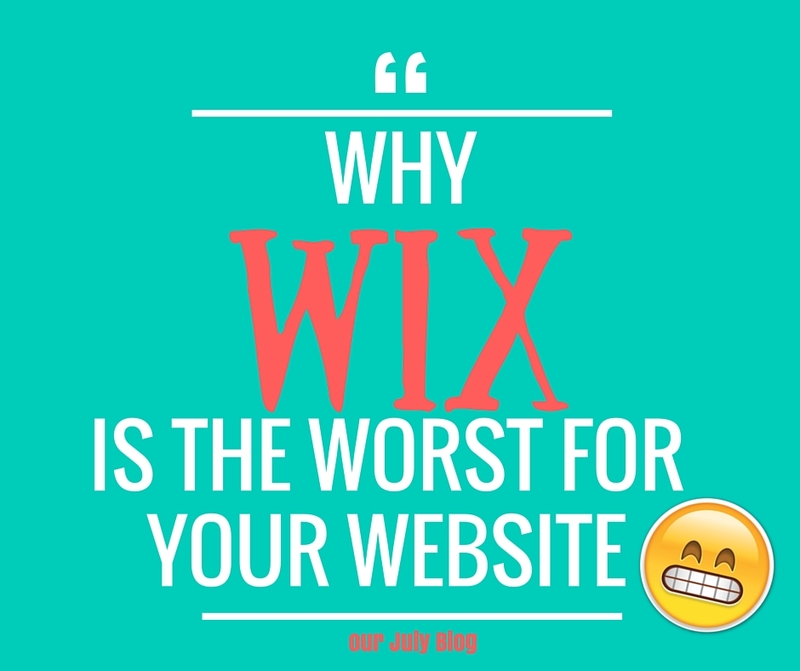 Why WIX is the worst choice for your website! We have all seen the big marketing hype and commercials regarding the "do it yourself" Wix website. They make it seem so easy, so simple and not to mention cheap. Well, I hate to tell you (and I like a bargain as much as the next person) but when it comes to Wix- the adage of "you get what you pay for" rings true. your business both online and in the real world - but ONLY if you have a great online web presence and sadly a Wix website will always fall short. 1. If you are using the Wix domain name with their free account, for example...yourbusinessname.wix.com, you are pretty much stating that you are cheap and lazy. These sub-domains are FREE and it suggests that you will not invest in your own product/business. The most basic Wix plans also come with Wix ads that cannot be removed also promoting the "cheap" mentality. Sorry to be harsh, but it is not expensive or overly difficult to purchase and set up a domain name that is specific to your business. If you don't know how to go about this, that's fine, you can always employ a professional to assist you, it won't take long, and the cost is quite reasonable. 2. Yes, they make out that they are a big player in the website builder business and they do have some lovely templates - but so do many other platforms, and here's the thing...If it's as brilliant as they make it out to be - then why aren't major corporations and companies using them around the world?? (A-huh, I see you thinking! ...) Well, these major companies and corporations know that they need a website that will speak to their end users. They know and understand the importance of good user experience, and so should you. 3. Unless you really know about design and I am talking about website design - not what colours complement each other on a wall - then odds are you may think you have created a brilliant site but in reality it probably lacks substance, is dull or just plain stinks. At the end of the day you are picking from a small selection of templates and odds are - your website is going to look like someone else's - it cheapens the industry and your potential client/customer can become easily bored. The templates are NOT professionally designed with YOUR end goals in mind. There is somewhere in the range of 500ish Wix templates available on their website, whereas WordPress has over 3000. There are a myriad of paid and free themes available for WordPress however one of the big players in premium theme sales, Template Monster, has discontinued their paid Wix themes and instead recommending Monstroid, a WordPess theme. The level of diversity for WordPress is much larger and can be modified using the theme options by a regular user or a developer. 4. Both platforms have their designs based on themes, and as mentioned above there are many more themes available for WordPress than for Wix. While this may be due to the fact that WordPress has been around for much longer, there is also another factor that comes into play between the two in terms of themes, and that is changing themes within development. WordPress allows you to change between themes until you find the right one without losing any data however with Wix, you need to make sure that you choose the theme that you want before you select it as you won't be able to change it later. 5. Whilst many of you may be thinking "I am just a very small business - so I just need a basic site" - you need to remember that first impressions are everything. It only takes between 1-10 seconds to gain someone's interest on a website before they will move on to the next one. It is important that you think outside the box and make a lasting impression with the customer. Professional design is a real process, goals need to be addressed, questions asked and the site needs to function so that it has a great user experience. The best user experiences are the ones that you don't even notice have been implemented, and this requires research into your specific business goals and how best to achieve them with an aesthetically pleasing design. The ultimate goal of a website is to convert users into leads, and that can be achieved in many ways. Expert website designers will identify know these goals and optimise the website design to achieve thesm, whereas Wix is a set design that does not cater to the individual and cannot be altered. 6. SEO (search engine optimisation) is a huge concern for all businesses online. If done well, it can help your business become number 1 organically in the search results or if ignored and place you 10 pages back. Wix has come under fire for poor customisation in terms of SEO however in recent years they have addressed these concerns and are allowing much better levels of SEO amendments. The main thing to consider for Wix sites in terms of SEO is that your site is hosted in the U.S. This is definitely harmful for Australian sites, or businesses whose operations are conducted outside the U.S. as search engines take the location of the site hosting into account. Sites hosted in Australia are ranked higher for people who are searching within Australia than those hosted in other countries as Google tries to look for local businesses for the user. So in actual fact, that cheaper hosting plan may be costing you more than you think. WordPress sites are able to be hosted on a number of hosting providers and is easily exported so you can switch hosting providers whenever you choose, whereas with Wix you cannot. 7. Writing code for a website takes planning and a view of the whole picture to be fully effective. This efficiency leads to a faster web that requires less data. Compared to a custom built or WordPress site, Wix doesn't give you much flexibility. WordPress or custom built sites can be modified endlessly, whereas Wix is limited. Just as we are all individuals so is your business. You need a website that is easy to navigate and is specifically designed for your business. Most websites will need some kind of extra coding outside of the general display of information. Some may only need a contact form, but others may need more involved applications, such as specific restrictions on dates and times for a booking form. There are plugins for both of these needs, and while a non-developer can implement a contact form plugin and a booking form plugin, they cannot extend a generic booking form plugin to incorporate their specific requirements. For example, recently we have extended a booking form plugin on WordPress for a customer that was closed on Mondays and also wanted to prevent bookings within 4 hours of arrival and show a custom message if they were to choose a time within those 4 hours. A non-developer would not be able to make such customisations as they go beyond the regular bounds of the plugin and the site loses functionality and causes frustration for both the user and restaurant. WordPress developers are fairly widespread and the plugins available are almost endless, so if you can't find a plugin that does what you need, you can certainly find a developer that can do the work to get it to do what you need. The moral of my rant - if you want a professional website with great user experience that works well with Google - then do NOT use a Wix site. Invest in a smart professional website from Central Coast Web Design Not only do we know what we are talking about - but we love what we do and we do it well. Take pride in your business and get yourself a decent website today - the cost is less than you think in the long run.